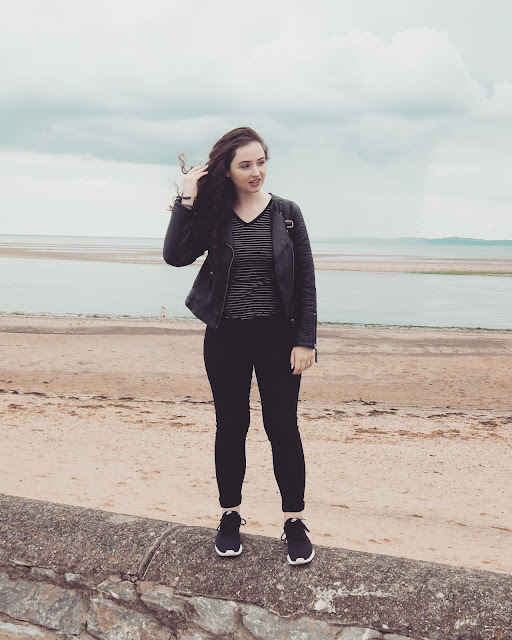 When it comes to days out, I am a big fan of exploring your local area because there is always so much more to discover than just the H&M in the city centre (although I do love a good rummage around in H&M). There's definitely a strong argument for staying local too: it saves money, you are paying into your own local economy, you can support local small business owners, and you just don't have to travel as far. That's not to say that I don't love travelling but with a little bubba in tow, the less time we are sat in one place (for example, on a train) the better. 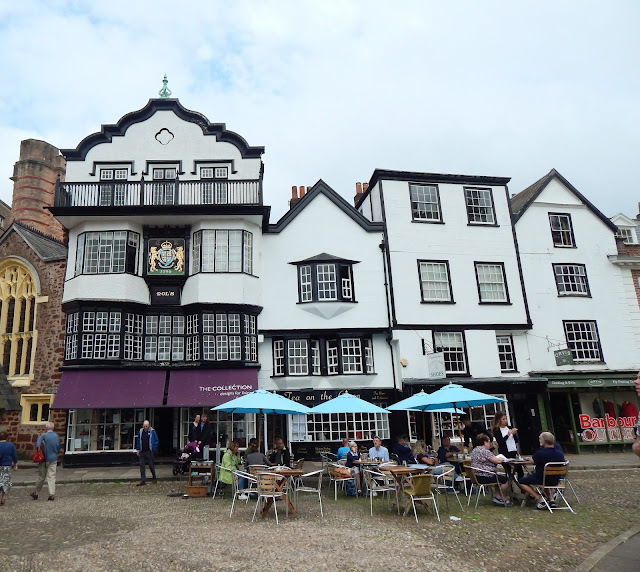 Exeter is my local city and I have been going there for shopping trips since I was about 13 years old but there are still new things that I am learning about the city and different restaurants and places that I am yet to experience. Today I want to share with you the gems I have uncovered in the city and surrounding areas so far. 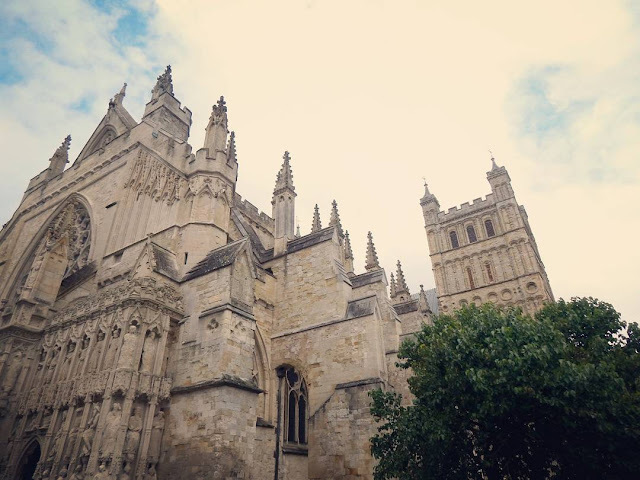 Cathedral Green is such a lovely place to sit down with some friends, order a pesto, tomato, and goats cheese panini, crack open the elderflower cordial, and soak up the historical surroundings. The cathedral was founded in 1050 and completed by 1400. There are lots of old buildings surrounding the cathedral as well and some traditional cobblestones to give you that old-worldy vibe (and to break your ankle if you attempt to wear you heeled boots). I would recommend Tea on the Green for delicious food and outdoors seating (perfect for pretending you are a glamorous Italian woman laughing over her salad on the sunny Continent). Also Cakeadoodledoo is a must-visit location just down the road from the cathedral. 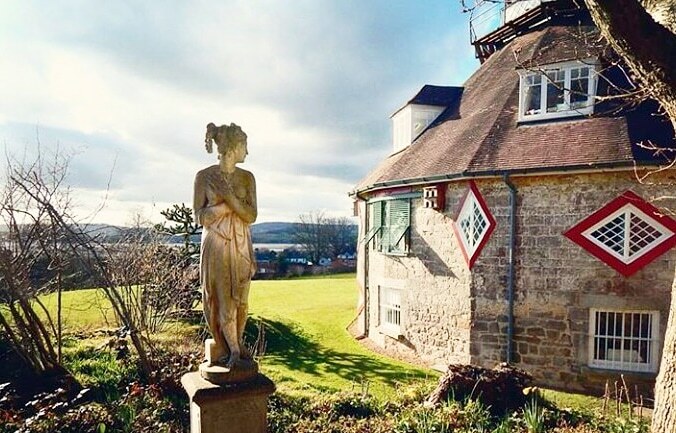 Although I grew up around here (and had many a school trip to the city), I only recently found out that there are underground tunnels beneath Exeter. And they are open to the public! So, I went with my family and the tour was really interesting - apparently people lived in these tunnels during the war! I mean, it is every kid's dream to find that there are secret tunnels under your feet so definitely one for the family. But then my dad kept bumping his head on the roof of the tunnel so maybe for the shorter family members. Also it is only £18 for a family ticket. As you know, I am basically an old woman. I go on coach trips. I love markets and fetes. And I am a big fan of anything historical. I mean, this blog might as well be sponsored by the National Trust the amount I talk about them. But one other thing that I absolutely adore is a good museum. One with interesting items - especially those that are a bit wacky and out there. I write about A La Ronde on this blog all the way back in 2015 and I recently revisited it with my family. It is such an interesting building - definitely would be a hit with the architects that live amongst us - as it is hexagonal and built so the light follows you around the house. It is definitely worth a visit. The quay in Exeter is somewhere that I don't go very often but I know that many people go there in the summer to sip cocktails overlooking the water. This is definitely something I want to do this summer too. But the quay also offers things like canoeing and bike riding which sounds slightly more exciting to me. In fact, I have been canoeing on the quay before - back when I was in my teens - and we managed not to capsize and I am still proud of that years later. I haven't been on Exmoor since the years of primary school enforced hiking but it is somewhere that I want to visit again. Exmoor is a national park - which means it is a protected part of the country - and it is inhabited by the Exmoor ponies which are ponies that are native to this part of the country but are also endangered. It is lovely to see animals free in their natural habitat - and this is a rarity in the UK where most of our animals are either in captivity or are domesticated. Exmouth is another place to I have written about before. I have been going to Exmouth since I was a teenager and I love it. It has everything a coastal town should - a sandy beach, multiple ice cream parlours and fish and chip shops, and a lovely, quaint town. And a KFC. Gotta love a KFC. This is really helpful. I've always wanted to visit Devon and I'm planning to go to Exeter this year so I've bookmarked this page for future reference. I really fancy exploring the tunnels.